A wonderful find from England: a toy grocery shop from the 1950s, complete with original products (lots of tea, of course!). The shop is 15 1/2 inches tall. 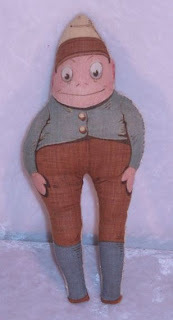 Ooooh: how nifty is this: a Palmer Cox Brownie doll from 1892! Palmer Cox was an illustrator who achieved fame with his cartoon creations, the Brownies, in the late 1800s and early 1900s. The Brownies appeared first in comics and books, then quickly spawned a range of merchandise that was extensive even by today's jaded standards. Brownies appeared on everything imaginable: handkerchiefs, china, toys, cookies, sheet music, household utensils, even a humidor! Their greatest marketing triumph occurred when an early Kodak camera, the legendary Brownie, was named after them. This 7-inch Brownie doll is from a line of printed cotton toys that purchasers cut out, stuffed, and sewed together themselves at home. 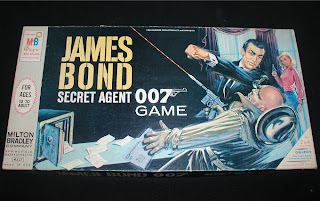 Been finding a lot of great vintage board games lately. This is good news for me, as I LOVE playing board games, but bad news for my sweetie, who I suspect is growing tired of being asked to "play it just one more time, pleeeeeease?!" 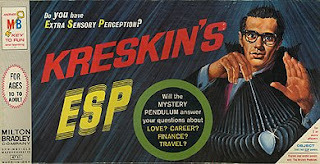 Anyway, today's discovery is a 1960s Kreskin's ESP game, featuring a youthful Kreskin himself on the cover. As an aside, I've actually met the Amazing Kreskin (his full title) and was forced to participate in one of his mind-reading effects in front of a theatre full of people. As I am painfully shy, this was not fun. Hopefully the game will be, though! 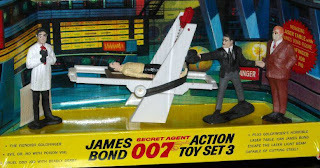 Got this 1960s James Bond Secret Agent 007 Game last week. 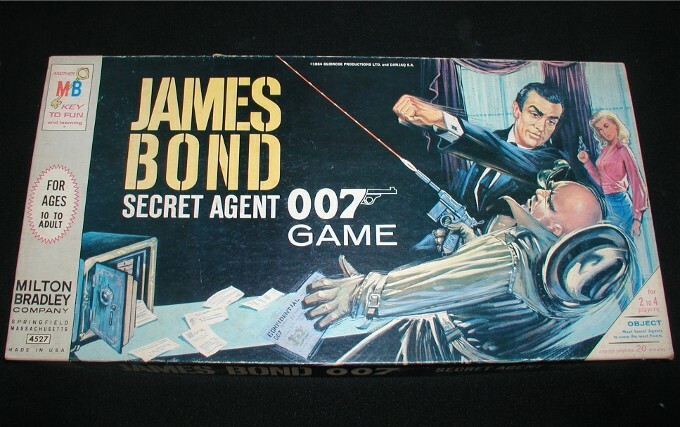 It has a great likeness of Sean Connery on the cover, and tiny plastic James Bond figures to use as markers ("Pawn, James Pawn"...) The game play seems rather complicated, but then, so do the plots of most Bond movies, so I guess that's suitable. One of my favorite tin toys is this 1930s Hercules Ferris Wheel made by Chein. It's so bright and cheery, and features that great smiling face in the center spoke: it makes me happy just to look at it. Horse kiddie rides are, in my opinion, the ultimate toy collectible. Who doesn't have childhood memories of riding a mechanical horse outside their local grocery store or at a roadside amusement park, and wishing fervently that they could take it home? All you needed was a quarter (or earlier, just a penny or nickel) and the ride would begin, the horse "galloping" off, taking you far away from your everyday world. I never thought I would be able to own one of these myself: most mechanical horses are quite large and incredibly heavy. But this one is smaller than commonly seen, about 40 inches tall by 40 inches wide, and thus just the right size for my little living room. The horse was made right around 1940 by the Allen Herschell Company of North Tonawanda, New York, a maker of carousel horses since 1915 (with an earlier incarnation of the company dating back to 1873). He still works after all these years, gently gliding up and down, taking us off to parts unknown. A local antique dealer found this minty 1920s American teddy bear at an estate sale and saved it for me. The 10-inch tall teddy appears absolutely unplayed with, and the faint mothball odor that attends it suggests it was carefully packed away when originally received 80 years ago. I always have mixed feelings when I find an old toy in such shape. While it's wonderful to see a toy in this beautiful, original condition, it's also a bit sad to realize no child ever got the chance to play with and love it. 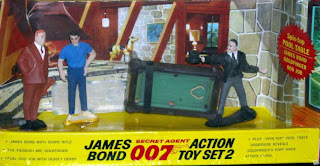 Often the wear on a toy gives it a unique charm all its own, along with a sense of its history. Still, I'm delighted to have this minty-fresh little guy, and he looks very happy to be out of his box at last! 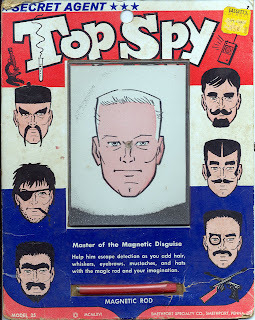 Found at an antique market this past weekend was this great 1960s magnetic toy, similar to the classic "Wooly Willy", but with a spy theme! I have a bunch of Wooly Willy type toys, but I'd never seen this variation before, so it was a pretty thrilling find.